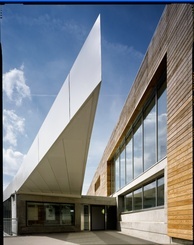 Located just inside the Easterhouse suburbs is the Platform Arts Centre. It forms one part of The Bridge complex, an overarching name for four facilities (John Wheatley College, Glasgow Life’s library and a swimming pool). It’s a bit of a trek if you’re not driving, but a number of First buses make regular routes to that neck of the woods. In the past the centre has organised minibuses to shuttle back and forth from Mono, particularly when they're hosting larger events. The centre’s distinctive, intriguing architecture house a spacious, well-designed gallery, a café, an additional library, and some rehearsal spaces, meaning that more often than not the space is alive with community activity. The gorgeous performance hall at the heart of the centre channels a subtle dance-hall aesthetic, and is designed in a way that allows for a generous amount capacity-wise, yet preserves an intimacy and immediacy more often associated with smaller venues. Additionally, Platform’s size and approach to events and exhibitions also means it's the host of a number of unique mini-festivals, and multi-disciplinary arts takeovers, making it a varied and exciting place to check out.